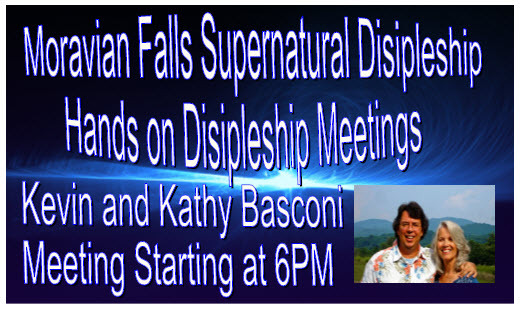 Kevin and Kathy Basconi and the whole King of Glory Ministries International family want to invite you to join us for our new Moravian Falls School of Higher Learning Discipleship Gatherings in the very heart of beautiful Moravian Falls, North Carolina. Moravian Falls School of Higher Learning. Each month we will gather to fellowship, preach the Gospel of the Kingdom and minister as the Holy Spirit leads. The focus this month is on the prophetic and praying for healing and miracles. FREE Event but registration is suggested as seating is limited. *King of Glory reserves the right to refuse admission at our discretion".